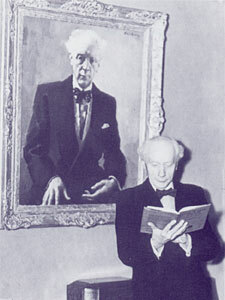 F. Matthias Alexander, standing in front of a his portrait, possibly reading one of his books to himself. What’s so special about his Technique? The other day while shopping in the supermarket, I happened to overhear part of a conversation between two middle-aged women. One said something like: “You’ll learn to carry yourself with greater ease, you’ll have greater self-esteem and your breathing will be fuller and freer. You’ll feel better and have lots more energy.” The second woman asked how she could find out more. Call me naive, but I was certain the first lady was talking about the Alexander Technique. I was just about to chime in and introduce myself when the it turned out that the method they were talking about was Pilates! Of course it could just have easily been yoga, the Feldenkrais method, Rolfing or any number of other methods that have a reputation for helping people improve the way they function. And of course it could have been the Alexander Technique. But the odds of that are pretty low. 1. What is it that draws people to take a first lesson in the Technique when there are so many other options available that seem to offer the same sorts of benefits? 2. What causes them to continue with the Alexander Technique teaching process beyond the first few lessons? Think back to your own early experiences with the Technique: What motivated you to go for your first lesson? What kept you going? In my own case, the answer to the first question was an article in Toronto Life Magazine about the Technique, and the one teacher in all of Canada at the time. I can remember reading and re-reading it, thinking to myself, “Wow, this seems like a great way to improve the way I look and feel without having to exercise!” I also had a colleague at work who was taking lessons who looked better in ways I couldn’t articulate, and whose back pain all but disappeared after a few weeks of lessons. As for the second question, the Alexander Technique turned out to be exactly as I had imagined: an amazingly effective way to improve my physical being without doing any exercise. I never noticed changes during a lesson – or even well into my teacher training course. But that didn’t matter to me because all sorts of amazing changes were taking place outside of lessons. Perhaps most dramatic was a gain in height of about 3/4 of an inch and the need to replace most of my pants within a month of starting lessons. I was hooked pretty much from the start and found it very surprising when Paul Collins, one of the Directors of my Alexander Technique training course, said in class one day that it’s when a new student makes a significant change, and knows it, that he or she is most likely to stop taking lessons. As for why this would be the case, he speculated that it could because of fear of more, unpredictable, changes. Or perhaps, at some unconscious level, not wanting to face having been the cause, at least in part, for their past misuse and not wanting to take responsibility for themselves in the future. When I started teaching, my second student did precisely this. On her third lesson she went on and on about how much better she felt, how her friends noticed that she looked so much better, and that her neck pain had all but disappeared. She cancelled her fourth lesson, and that’s the last I heard from her! For me, lessons always had just the opposite effect – the more I changed, the more I wanted more lessons. In my case, greed for more of a good thing always overcame any hidden fears of the unknown, or regrets about my earlier misuse of myself. I have to confess that these were trickier questions to answer than they seemed at first glance. They forced me to go back in time and try to see things from my perspective of over 35 years ago. So, once again: What were you thinking when you first decided to take Alexander Technique lessons? And why did you continue taking lessons? I’d love to hear your responses to these questions – and I’m sure other Alexander students and teachers would as well. Great post and great questions! I decided to investigate Alexander Technique lessons on the suggestion of my mother in my quest to find something to help the debilitating neck pain and headaches I was having at the time. I was at the point where I would willingly try anything that sounded promising! Even after my first lesson I had a sense that this was something different and would be a way for me to get back control. I guess I continued because it seemed the more I became skilled in applying the Technique the more my neck problems receded. I loved feeling back in control – I think that was a big thing for me. I also got more and more fascinated by other aspects of the Technique – other benefits I was experiencing… so much so I decided to train to teach it myself! Thanks for sharing. A lot of people, unlike me, were drawn to the Technique because of pain. You were lucky your mother already knew about it and could steer you in that direction. Thank you for this post. I have been thinking this question over and over again. Where do those students that clearly feel better after lessons, disappear? I didn’t have any pain or anything like that. I had breathing problems, but I didn’t think technique could help me with that. I think I liked the Technique because it brought me closer to myself. I was totally lost and stranger to myself that time. Of course I didn’t know that then, but it must have been the main reason, because I don’t remember any feelings of lengthening or easiness or anything physical sensations like that after lessons. I also liked the fact that I myself could do something for me. It wasn’t so much the Technique itself I was fascinated about. It was me – getting to know me! I think that was the reason to take lessons. Thank you for sharing your experiences. It’s interesting how being interested in “me” can take such different forms – for myself, it was a lot about looking better while for someone else, it might be about deeper levels of self-discovery. The technique appealed on multiple levels. I was in pain, was a public speaker, and interested in spiritual awareness development. Nothing before appealed to multiple interest, as the AT. I was inspired, and soon hooked. Interesting combination. And I’m glad you were hooked! Good question! I was drawn to AT because I thought it might help me quit smoking. Which was a strange idea, because no one said it would. I also was attracted to the absence of metaphor, which at the time made AT stand among the general run of approaches to self-knowledge. Yes – I remember how many A.T. teachers deliberately shunned using metaphorical language for a number of reasons. Metaphor implied constructing a model that later had to be cleared away. Making metaphors encouraged later “end-gaining” as a short-cut to attempt to recreate past successes. Rather than a new experience being “like” anything else, an A.T. experience was deliberately allowed to be exactly what it was – new. It was one of the main differences in how Marj Barstow would ask her students for their impressions after hands-on work with them. The fact that people were able to describe what was new and then also remain determined to follow a new process toward discovering another new experience was part of what made Marj’s approach so revolutionary to the field. She would agree with whatever a student said, as long as they were using A.T. while they said it! Declaring an intention specifically and then carrying it through into action is a sort of auditory visualization – but that’s a bit different from using metaphor. I was engaged by the reasonableness of Alexander Technique. The lack of a requirement to buy into cultural values was also attractive. It offered me a starting point at any range of physical ability, (which is what repelled me from becoming dedicated to Aikido which offered similar benefits.) Also – I had stumbled upon it so serendipidously that it seemed obvious to pursue it further. What A.T. had that no other discipline offered me was the possibility that discoveries and progress were designed to be gained improvisationally from insights that could happen at any moment, in the context of any motion or activity. In that way it satisfied me in a Zen-like “chop wood, carry water” sort of all-points awareness that freed my ponderous seriousness. Althought it took quite a bit of time to learn, it was also delightful that practicing what I had learned so far only took a bit of directed consideration while moving. Clearing an extra hour a day of practice wasn’t required – only a bit more mindfulness. Franis, it’s interesting how different your reasons for staying with the AT at first were so different from mine. You were obviously more precess oriented and I was a straight-up end gainer! Sometimes being “into” process can be its own limitation too! My reasons for becoming attracted were from having recognized a benefit in awareness philosophies and having had some amazing awareness expansion experiences. But I didn’t have a tangible means to express what I valued. I was really looking for a discipline that would offer me a means to practice that fit my ‘style’ of lifelong, gradually improving dedication. Plus the rest of the crowd who was attracted to A.T. were creative, interesting and open-minded. Then I was exposed to A.T. from being connected to another person (Israel Feldsott – made a point to get to know him after noticing how effortlessly he tied his shoe) who was a teacher at Jack Painter’s Postural Integration (in 1974, when he was 20) before he became interested in A.T. He was fascinated with A.T. because a teacher could give you a direct physical experience of being able to do it before you could do it yourself. What made me take Alexander Technique lessons? As a musician, I started experiencing pain in my hand, which eventually morphed into severe neck pain. I had to stop playing. What kept me taking lessons? What attracted me to the alexander Technique? I thought it was simple and logical. Plus, I could learn to do it myself; Anyplace, anytime. And, Mister Mark, look at where it’s got you today!! I took my first lesson during college (at a music school) purely out of curiosity, in response to a flyer advertising a free lesson. I didn’t like it, so I wrote off AT for more than a dozen years. I tried it again at the urging of a friend who thought it would help me with some neck pain, after I saw another flyer for a free lecture/demo+free lesson. I LOVED the lecture/demo and being a volunteer for tablework during the demonstration, but I did not have a good experience with the private lesson. My friend pleaded with me to try once more, because she thought I just needed to find “the right teacher for me”. After a strange series of events, and finding myself in the midst of an unrelated personal crisis, I ended up with $1000 in my pocket from an insurance company, so I decided that was meant for AT lessons. The third teacher opened up the door, I took one look at him, and I knew it would work. I wanted daily lessons, but he only agreed to give me two per week. My neck pain was completely gone within just a couple lessons, but so many other amazingly wonderful changes started to take place that I continued for months, and ended up becoming a teacher, myself. You never know where Life will take you! And, Jennifer, now you’re a pioneer in Alexander Technique directing technology! The universe is one damn amazing place. 1.it just meant exactly what i was looking for for a long time. it was something that at last showed me where i was wrong and that was also absoloutly because of my great teacher.and i was those kond of student who had a change in only a setion. I came to AT seeking to improve my bow technique. A clear, narrow purpose. A fix, of a sort. Total endgaining. In the process, I discovered I had shed an unrelated habit of 35 years, the result of being in casts after an accident. More important, I had not told my teacher about it, nor had the teaching room environment permitted its expression. It had never been noticed in the classroom. Equally important, I found myself inexplicably making wiser decisions: not losing my temper driving in situations that used to send me into a rage; racing to the store before they closed in order to get a bag of cookies, and then looking at the cookies and calmly saying “Nah”; finding myself wondering how I could be a better husband. Really weird stuff! Stepping outside of myself to consider all this, there was no way I could stop lessons. But coincident with these rewards, I noticed that the more I learned, the more mysteries appeared. This has continued since being certified. Mysteries abound. Now consider this: which is more stimulating, which is more entertaining, which is more engaging of the mind; which is ultimately more rewarding, a good answer, or a good question? A perennial question that keeps coming back, obviously! But your observation skills and how they expanded, that was interesting to notice…and to attribute it to lessons. A good question for sure! Great comment. AT was part of my acting school curriculum on my junior year abroad in London. At first I thought it was hooey. I was 20 years old and a skeptic. Then one day after a lesson I stepped out of the AT studio and there was a tree…greener and more vivid than any tree I had ever seen. I knew then that this amazing technique was transformative. I wanted more so I took lessons for years. Thanks for sharing Mary. And now you’re teaching this “hooey” method! Robert, I was in a mess (emotional stress, stressful job, obsessive-compulsive disorder) and had tried just about everything else, and read just about every self-help book ever published. A friend kept telling me to take lessons and lent me Wilfred Barlow’s book. But it was only when I got to the end of my tether, when my health and my job were at steak, that I dialled the number she had given me. So, my reasons for taking lessons in the first place are different from yours. But the reasons for continuing are pretty much the same as yours: I wanted more of that good thing! Weekly lessons were, for me, stock taking, finding out where I was at. I continue Alexander Technique work because there is yet more to be had – and this, to me, is the amazing thing. There is very little in this world of which you can have as much as you like – on and on, which never runs out. The Alexander Technique is that. i continue for hedonistic reasons: I feel better, happier, things become more managable, life becomes more easy, I lough more, i love more, I am enjoying life more. And I don’t feel guilty about it! Thanks for that Magdalena. Sometimes it’s not easy for those of us who had no obvious problems, but were just drawn to the ideas of the Technique, to appreciate how others have to be, as you say, at the end of their teather, before their sign up. Interesting article, but I don’t understand why you needed to replace your pants within a month? Was the height increase in the 1st month, even so the length increase would be negligible since it would affect your spine more wouldn’t it. I’ve just started AT last week. Could have been because of where the pant’s waist was – I’m not sure – but they all became too short within a few weeks. I read an article on horse riding written by an AT trainee teacher which lead me to one of his horse riding workshops. I remember shaking from head to toe and getting a migraine as I witnessed and received an extraordinary and life changing horse riding lesson. The workshop resonated with me so strongly I knew I had to work with this teaching. I was advised to find a qualified AT teacher for lessons, which I did, overcoming some huge obstacles to do so, and became aware that my teacher in particular and the other AT trained people I was meeting had “something” which I didn’t understand at that time but knew I wanted to find within myself. The focus shifted from horse riding to teaching AT and here I am in my 70s in endless gratitude and appreciation to my initial mentors of 30 years ago for inspiring me with their grace and introducing me to one of the most valuable learnings of my life. That’s a beautiful account Jennifer. Thanks for sharing.